For years, his figure has been surrounded by an expectation rarely seen in baseball. And being one of the most promising players in Japan, Shohei Ohtani became just one week the biggest sensation in the US Major Leagues, the best baseball tournament in the world. Even before his first appearance with Los Angeles Angels, Ohtani was already being described as "the best thing that has happened to baseball in a century" or the "modern version of Babe Ruth", for many the best player in history in the bat sport. Expectation to which the Japanese baseball player responded in an extraordinary way. In just his first week as a Major League baseball player, Ohtani generated all kinds of headlines by exalting his figure, with qualifications such as "unreal", "crazy" and "from another planet" accompanying his name. His teammate, Puerto Rican catcher Martin Maldonado summed up the widespread feeling in baseball in the United States, from amateurs to the most experienced specialists: "We have not seen anything like it". The fact is that Ohtani is one of the strangest phenomena of baseball and is able to perform at the highest level as a pitcher and as a hitter, something that was not seen for almost a century. That duality was evident in his first seven days in the uniform of the Angels, as his statistics show: Only the third player in history to win two games as a pitcher and connect three homers in the first 10 games of his team. In his second game as a pitcher he made 12 strikeouts, equaling the American League record for a pitcher in one of his first two games. He equaled Babe Ruth as the first player to hit three homers in three consecutive games in the same season in which he started a game as a pitcher. The "Bambino" did it in 1930. That's why it was not surprising that he was chosen as the best player of the week. The professional baseball league of Japan is considered by level of organization and economic capacity as the second most important in the world, so it is not so surprising that there are players who regularly take the jump to the United States. But what is not so normal is that a player from the level of Ohtani, beyond the crucial role played by his family in his training. 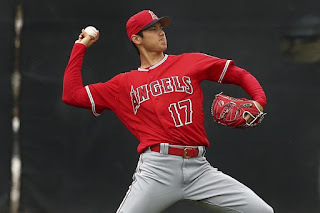 According to his evolution, Ohtani's father, Toru, had his children as receivers when he returned home after his day's work in the production plant of the car manufacturer Mitsubishi. When he was in high school, baseball's promise still registered the fastest pitch in the history of collegiate leagues, reaching 160 kilometers per hour. His intention was to start his professional career directly in the United States, but he was persuaded not to rush his evolution and continue to grow in Japan for the Hokkaido Nippon-Ham Fighters team. The key to the negotiations was the last presentation, in which they proposed an ambitious plan to turn him into the most multifaceted player of the 21st century. From then on, the records began to appear. The first of them was the one he achieved in 2014, when he became the first player to retire 10 opponents as a pitcher and connect 10 homers in a season. Now, at 23, it was the turn of the United States to meet him, to the joy of all those who have followed his career in Japan. "No, not Ohtani, my publisher will not accept such an incredible story, it has to be more realistic," the artist Tsunomaru, one of the most recognized in manga culture and anime, quipped in a message on Twitter. For now it is clear that reality exceeds fiction.